It’s been over three years since Eureka seveN finished airing; the original series followed the crew of the Gekko as they… saved the world, I guess. The series was an ultimately uplifting adventure, and even though the series dipped into shady issues of morality, I think it’s safe to say that almost everyone was a “good guy” and the story ended with almost everyone happy. 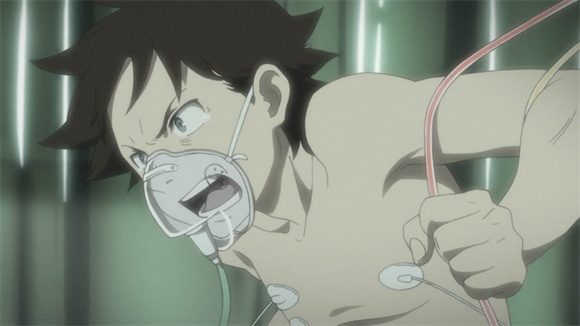 This year, Eureka seveN: Pocketful of Rainbows added a feature film to the universe, featuring almost all of the characters and places from the series. And it’s all gone wrong. Every character has changed. Renton, Eureka, and a chibified Nirvash have been raised together since early childhood by Renton’s parents and their teacher, Dominic. After Dominic and Renton’s parents die in an experiment, Eureka is taken by the military as a “highly classified subject”, and Renton joins the military as a Sergeant in the Independent Youths Assault Unit 303; this unit is based in the Gekko, and its members cover everyone you’d expect to see aboard. However, this is a different Gekko and a different crew; while the ship is usually warm and inviting in the series, the film’s Gekko is cold and harsh. While fighting the Image (Coralions by any other name), Holland chastises Renton for attempting to save fleeing civilians, and tells him to focus on finding their goal: retrieve a highly classified subject. It feels so bizarre to see this. Of course, this subject is actually Eureka, who is reunited with Renton by Nirvash. However, Holland and the others have ulterior motives; they are war orphans, but were used as test subjects in the experiment that killed Dominic, and their bodies are aging at triple the normal rate. They have murdered Dewey, their caretaker, and are following a legend that says Eureka and Renton can send them to a world where they will not age, thereby prolonging their lives. They quickly go rogue, and the military sends an investigator (Coda) in search of them. Anemone appears as an old woman with a chibified theEND, a sage who participated in the first experiment and a sometime guide for Eureka and Renton. Jurgens is a minister, Dewey was a victim, and Renton’s sister is a government scientist; it seems like almost every character has switched sides or roles, and only Eureka, Renton, and Anemone have the pure hope shared by almost everyone in the series. The characters and plot of Pocketful of Rainbows are much darker than in the original series, and it’s a bit unsettling to see the crew of the Gekko playing the villains instead of the heroes. It’s also quite confusing; seeing the same characters with different relationships, motivations, and outooks is quite disorienting at first; seeing Holland and company ignoring the well-being of others to resolve their own . But while the series seemed to show how hope and love could triumph over depression and adversity, Pocketful of Rainbows pits hope against the crew’s despair for their rapidly dwindling lives, and orchestrates it very well. Another issue in characterization worth mentioning is the relationship between Renton and Eureka. In the series, Eureka was confident and often led the confused Renton along as a new member of Gekko State, and a significant portion of the show is devoted to Renton’s growth from a young boy into a man willing to take responsibility for his actions and make sacrifices for his beliefs. Though the film’s Renton also struggles with his inability to protect Eureka, he is much more confident from the start, and leads Eureka through the film; Eureka, on the other hand, is much more passive than her televised counterpart. I found this change somewhat unsettling; I thought the reversal of stereotypical gender roles in Eureka and Renton’s relationship in the series was interesting and prompted some really interesting character development. That said, I’m probably the last person qualified to write about gender studies, so I’ll move on. The interplay between the series and the film is perhaps the most interesting product of its production. Several times, the film references scenes from the series in context (it also reuses some animation from the series out of the series context). 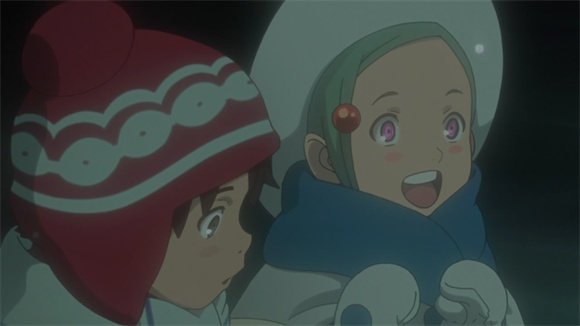 When the orphans are subjected to the experiment, they see the planet at the end of the Eureka seveN series: encircled by a green ring, and with an engraved moon. And in one scene, the film returns to the end of the series, with Renton’s grandfather, Maurice, Maeter, and Linck at the top of the hill in Bellforest. With all these similarities, the obvious question to ask is how the film and series relate in continuity. The character differences make it clear that the film is neither a direct sequel nor a direct prequel to the series. 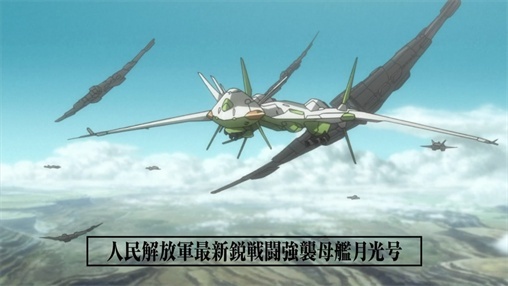 However, Pocketful of Rainbows takes place in the near future, around 2054, while Eureka seveN is set millennia after the present day. The resolution of the film seems to precede (and even set the stage for) the series, but the references to the series’ end suggest the film follows. One popular theory states the two exist in parallel timelines, but this feels unsatisfying to me, and seems to ignore the set-up for the series that the film makes. Anemone’s references to the “storywriter” make me wonder if the two aren’t intertwined and repeating, each leading to the other in the future, and rewritten every time by a new observer. But I digress. Don’t ask for it, go out and win it. Do that, or you won’t get anything! In the Eureka seveN series, this was Holland’s catchphrase; Renton repeated it as a mantra when he aspired to be like his hero. In both the film and the series, the phrase gives Renton strength and motivation to fight his enemies, but it’s extremely moving to see Renton in the film paralleling Renton from the series. Even though it’s more significant in terms of character development for the series Renton to be “manly”, it’s still extremely touching to see the film’s Renton do a bit of the same, and it comes in as Moment #11. While I can truthfully say that I enjoyed watching this film, I can’t bring myself to rewatch it. Eureka SeveN is a big favorite of mine, and my completing it in 2009 makes it probably the most fulfilling viewing experience I had all year. After watching this movie, I was entertained — if apologetic for my own experience. I liked the touches it did in homage to other works (a main thing why I like E7), particularly with how Holland’s mecha used ‘Funnels’ straight out of Gundam. 1. Dewey’s disappearance from the narrative altogether. 2. & 3. Hap and Stoner — this was just awful; two endearingly woven side characters reduced to cowardly villains here. It’s revolting to recollect; which is probably why I can’t bring myself to watch this movie again.